Brothers who served together in the 60th – The 60th Battalion C.E.F. 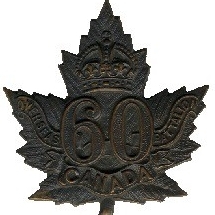 "Victoria Rifles of Canada"
There were 46 sets of brothers who served together in the 60th Battalion. Two sets of brothers died during the war and a total of 19 nineteen men lost a brother during the war. Two men were awarded the Military Medal for bravery and two others were awarded the Military Cross for bravery, one man winning it twice. One man was awarded the Belgian Croix de Guerre. * Indicates men who died during the war.